The tradition of BBQ is long and much argued about, all I know is that I really miss(ed) it. This recipe will give you extra sauce beyond the pork which can easily be used for chicken or beef. Preheat the oven to 275°f; Heat the oil in an oven proof pan with a lid over high heat. Brown pork on each side. Set pork aside, deglaze pan, add in apples and garlic and set pork on the apples. Cover and put into the oven. It will be about 3 hours until it’s done. The pork is done when you can pull away chunks easily with a fork. While the pork is cooking, slice the onions and cook them over medium-high heat until the onions are translucent, then turn down to low and cook until the onions are deeply caramelized and brown. When the pork is done, set it aside and cover. Transfer apples, juice, onions and the rest of the ingredients to a blender and blend until smoothish. Return to pan and let the mixture simmer for 20 mins to an hour until the sauce is rich and dark. 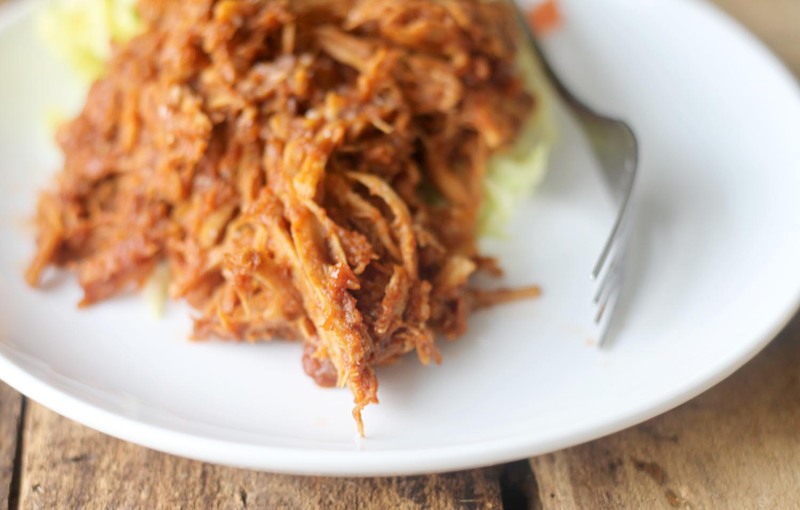 While the sauce is bubbling away, pull the pork apart with a fork. When the sauce is ready, spoon it over the pork and heat both for 5-10 minutes adding in more apple juice if the sauce seems too dry. Serve over slaw, sweet potato hash/fries or gf bun.